tcnorris: The Current State of Canadian Politics: Can the federal Liberals win a majority in 2015? The Current State of Canadian Politics: Can the federal Liberals win a majority in 2015? “We’ve always said we’re ready to work with other parties. We’re a progressive party. We want to get results,” NDP leader Thomas Mulcair told reporters when asked if he would be willing to form a coalition with Mr. Trudeau after the election. However, Liberal leader Justin Trudeau rejected the idea suggesting the Liberals would focus on a "winning" strategy. This incident tells us that the NDP thinks there is a strong possibility that the NDP and the Liberals together can form a majority in the House of Commons after the next election, while the Liberals perceive that they have a chance to form a majority government on their own. With everyone's attention on the Quebec election, perhaps this is as good a time as any to ask whether or not the federal Liberal Party can realistically expect to win a majority in the 2015 federal election. Based on my tracking of the polls and my seat projections TCNorris has reached some conclusions about this. Based on the trend line of the past year a Liberal majority is unlikely (there is one posssible scenario I will discuss below). Equally a Conservative majority is unlikely, but a plurality is possible. The most likely outcome would see the NDP plus the Liberals holding a majority of the seats in the House of Commons. There would be no way for the Conservatives to construct a majority through the support of other parties. Quickly now, when did this situation last appear in Canadian politics? The answer is 1972. In other words it has been over forty years since we have seen a situation at the national level where there is a potential for governance based on Liberal-NDP cooperation (this is what happened in the 1972-74 parliament). This could include either a coalition or an accord. It is the percentage of seats won that matters. To help clarify I have expressed what it would mean both in the House as it will be in 2015 and what it would mean for today's House if it was still in place. A majority in the current 308 seat house is 155, in the 338 seat House it is 170. The two parties do have some experience with working together. The NDP supported the Trudeau Liberals in exchange for various concessions in the 1972 to 1974 parliament. The Liberals and NDP attempted to form a coalition after the 2008 election, but needed the support of the Bloc to make it a possibility. The two parties did coalesce in Saskatchewan when the NDP failed to win a working majority in the 1999 election. The NDP was a very dominant partner in that arrangement. In Ontario the two parties negotiated an accord in 1985 that ousted the Ontario PCs from power after 43 years in office. The agreement permitted the Liberals to form a government for two years in exchange for implementing some NDP priorities. Some such as former Harper advisor Tom Flanagan believe that the public would oppose such a coalition in 2015, as they did in 2008. This strikes me as mistaken. Given the growing antipathy to Harper on the centre and left it seems likely that the public attitude welcoming change that prevailed in Ontario 1985 is the more likely outcome. The public will judge a coalition based on the context, not on some preconceived notion of whether it is a good or bad idea. If we look more closely at the messages the polls are sending about the state of politics in Canada right now in the various regions it helps us understand our current situation. In Atlantic Canada, the Liberals have taken a big lead. Their average support in the polls is at 50%, an astronomically high number putting them 27 percentage points ahead of their nearest competitor, the Conservatives. Were this repeated elsewhere a majority would be in sight. Why are the Liberals so high? Let me suggest a few factors. One is simply the fact that the Liberal brand in Atlantic Canada has been relatively strong over time. The current state of provincial politics also helps (there are good provincial poll numbers available in Atlantic Canada from Corporate Research Associates). There is a newly-elected Liberal government in Nova Scotia still enjoying its honeymoon. As Nova Scotia is about 40% of Atlantic Canada this alone has a big impact. In addition there are unpopular PC governments in both Newfoundland and Labrador and New Brunswick, both likely to lose the next provincial elections there to the Liberals. The incumbent Liberal government in PEI remains popular. In polling there is a spillover between the federal and provincial realms. Some respondents become confused about which level of government is being asked about. Given its strong brand this helps the Liberals in Atlantic Canada, and likely hurts the NDP, which still suffers from the unpopularity of the former Dexter government in Nova Scotia. Finally, it is clear that the Harper government is quite unpopular here. Quebec dislikes the Harper government more than any other province or region so the Conservatives are not going to increase their representation but opposition is split among the Liberals, the NDP and the Bloc Québecois with the latter two parties doing disproportionately well among francophones, while the Liberals are the dominant force among Quebec anglophones and allophones. Liberal strength has grown here but they still trail among francophones. Ontario is the biggest province and also where the federal Liberals have gained the least since 2011. The troubles of the provincial Liberals are a factor here. Ironically the situation in Ontario suggests one possible federal Liberal majority government scenario. For it to occur the Wynne Liberals would need to lose the expected spring election to the Hudak PCs. For maximum effect a PC majority would likely be necessary. My suspicion is that Tim Hudak would make the Conservative brand name quite toxic within a year in Ontario. Both the federal Liberals and NDP could benefit. If the federal Liberals could increase their Ontario support significantly at the expense of the Conservatives (with NDP gains held to a bare minimum) a majority might come in sight. All this depends on a set of events that have not yet begun to take place. And Ontario alone would not be enough. The Liberals would still need to finish a strong first in Quebec and must do exceptionally well elsewhere including B.C. I cannot stress enough that this is an unlikely scenario, but one cannot completely rule it out. It is also possible but not likely that the NDP will find a way to get ahead of the Liberals. This could happen if the public acquires a stronger sense of Justin Trudeau's weaknesses. The Liberals are poised to make significant gains in Manitoba in part because of unpopularity on the part of the NDP provincial government. 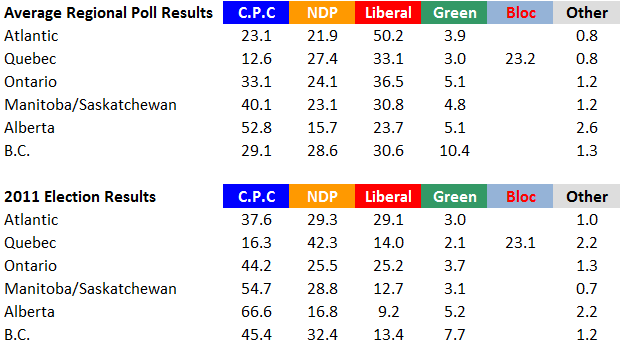 Something close to the status quo prevails in Saskatchewan, although the NDP seem likely to gain a few seats here as a result of the redrawn boundaries. Remarkably, the Conservatives are experiencing significant losses in Alberta. On average the party is down about 14 points since 2011. It is enough to give the Liberals a few seats if it holds through an election. I do think it is slightly overstated. The "Other" category is high in some surveys and I suspect that these are respondents who confuse federal with provincial politics, and volunteer the Wild Rose Party as their preference. This is where the popularity of the Harper government has declined the most. It is the Liberals who have gained the most from it although their 13.4% share of the popular vote in B.C. in 2011 was quite low by historical standards. For example, their current poll average of 30.6% is close to the 28.6% share the Liberals achieved in B.C. in 2004. NDP support is down a little since 2011. One possible liability for the Liberals here is a difficult term for the BC Liberal provincial government. Although it is a coalition of federal Liberals and Conservatives, the government is led by Christie Clark, a federal Liberal. Based on recent history it does seems likely that the B.C. government will get into political trouble between now and 2015, with the NDP the beneficiary. TCNorris does not think that a Liberal majority in 2015 is a realistic expectation. Justin Trudeau and company should keep their minds open to other governing possibilities. Thomas Mulcair to his credit just gave us a preview of what conversation we should expect after the next election: what form should Liberal-NDP cooperation take.